The maritime industry is embracing digitalisation at an ever-increasing rate. New ways to use the masses of data generated by vessels, ports, installations and cargo are leading to developments at rapid pace. We have invested heavily in this area, developing new capabilities that draw on our extensive practical and analytical experience to help our clients use this data to increase certainty in their projects. One of the areas where digitisation has had a profound effect on the maritime industry is incident investigation. Systems such as vessel’s “black box” Voyage Data Recorders (VDR), the ability to track positions worldwide by satellite using the Automatic Identification System (AIS), and the digitisation of navigation systems using Electronic Chart Display Information Systems (ECDIS) means that digital evidence has become critical following any maritime incident. Waves Group provide sourcing, analysis, and user-friendly presentation of this digital evidence. Utilising many leading software packages and direct links with data suppliers, we provide a complete service from our fast response CASPAR situational awareness reports, to full 3D recreation and simulation. This can be delivered as a standalone service, or as part of our incident investigation, management and expert services. The diagram below gives an overview of Waves Group’s digital evidence process. The next phase from the use and analysis of data leading up to an incident is obtaining situational data on the ground. Through the use of high-resolution 3D data, Waves Group has further enhanced its digital capabilities for asset management, damage assessment, visualisation and risk assessment throughout the project lifecycle. Recent advances in both data acquisition and communication technology have resulted in the ability to carry out high resolution 3D surveys both above and below the waterline with a considerably reduced equipment and man power requirement. This enables rapid, agile and cost-effective data acquisition. The data gathered, whether geo-spatial survey data, environmental data or just photo or video imagery, becomes key to understanding the situation, whether assessing the condition of an asset or understanding the extent of the damage following an incident. Augmented and virtual reality displays of the data can greatly aid communication across all project stakeholders, with access anytime, anywhere. 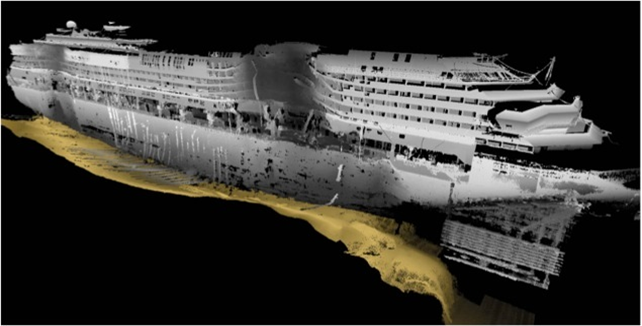 Below is a high resolution 3D survey of the starboard side of the Costa Concordia undertaken in September 2013 after the parbuckling. This clearly shows the damage incurred whilst she was on the seabed. The key benefit that this data and our tools give to our clients is the ability to make more informed decisions at the right time and increase the certainty of outcome. This is especially true at the early stages of casualty incidents for example, where faster, proactive decision making is essential. For further information about our digital evidence services, request a CASPAR report or a demonstration of our 3D data acquisition and analysis capabilities, please contact mail@waves-group.co.uk or telephone our 24/7 emergency response number +44 (0) 207 083 7266.